With Atlanta securely in Union hands, today in an attempt to break through the stalemate at Petersburg, Union General Ulysses S. Grant strikes against the Confederate forces of General Robert E. Lee on two simultaneous fronts. One assault, against Richmond, becomes known as the Battle of New Market Heights (or the Battle of Fort Harrison or the Battle of Chaffin’s Farm). A second assault, against Petersburg, is the Battle of Poplar Springs Church (or sometimes referred to as the Battle of Peeble’s Farm). In the first of the battles, a black regiment distinguishes themselves by bravely attacking the Rebels in a charge that many (including a writer in the American Baptist Home Mission Monthly) call one of the “most brilliant” of the war. They do so to the rallying cry of “Remember Fort Pillow,” the battle in which Confederate General Nathan Bedford Forrest had massacred scores of black Union soldiers at the end of the fighting. “Remember Fort Pillow” is, by now, a common and effective rallying cry of many black regiments engaged in battles against the enemy. In the famous charge, the 5th U.S. Colored Regiment valiantly charges the enemy, only to lose about half of their men to withering fire from the Confederates and an inpenetrable fortification of a network of tree branches with sharpened tops (an abatis). During the forced retreat, the color guard of Company G is felled. First Sergeant Powhatan Beaty, noticing the absence of the flag, returns some 600 yards to retrieve it, returning it to company lines. Not only does he retrieve the flag, but Beaty, the only officer remaining in his company, rallies Company G for a second, daring and improbable charge at the Confederates, driving the enemy, at that point in the battle lines, from their fortifications. 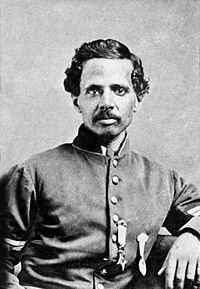 Although the Union loses the battle, First Sergeant Beaty, a Baptist, is commended by commanding officer General Benjamin Butler, and on April 6, 1865 is awarded the Medal of Honor for his heroic bravery. Born into slavery in Richmond in 1837, Beaty had moved to Cincinnati at the age of 12 and somehow obtained freedom by the beginning of the war. After the war is over, Butler goes back to Cincinnati, marries actress Henrietta Vinton Davis, and becomes well-known in Ohio as a dramatist and actor, often working alongside Henrietta in productions. Beaty dies in 1916 and is buried in Cincinnati’s Union Baptist Cemetery. Today in both instances the Confederates fight off the Union offensives, albeit at a cost: the Federal’s aggressiveness leads Lee to cancel plans to reinforce General Jubal Early in the Shenandoah Valley, effectively assuring that Early, already reeling from Union offensives there, has no chance of holding off the Federals in that part of Virginia.